Spanish potato chips cooked in extra virgin olive oil, crackers made with pilsner and porter beers, crunchy seaweed snacks coated with rice flour, and countless variations on flavored popcorn–it was quite the snacker’s paradise among the vast array of products at this year’s Fancy Food Show, which wrapped up this week in San Francisco. Sounds like fun, I’m sure, but my visit really was work. Particularly because I had only a few hours to explore the exhibition floors; not ideal, I wouldn’t recommend it, but it was that or nothing given my travel schedule. So there I was at the Moscone Center on Sunday morning around 9:30 a.m. — badge around my neck, suitcase checked, a printout in hand that listed the three dozen vendors I’d picked from among the 1300+ exhibitors for the show. I reviewed the list with my “Salty Snacks” blinders on, determined to consolidate my efforts as much as possible to make the oversized task more manageable. Map in hand, specific booths circled, the marathon began. Happy to report that the savory snack category was very well represented this year — can’t say for sure if more than last year, but at least more diverse offerings in my mind. Of course loads and loads of classic tortilla-type chips in various forms, and potato/sweet-potato chips and an increasing number of random puffy-type snacks. Even the “everyday” potato chip made some fresh appearances, like that delicious olive oil-fried chip (from a Spanish company, not sure how widely available in the US) and this Corkers brand out of England (where, of course, they’re known as “crisps”) with flavors the likes of Sweet Thai Chilli and Pork Sausage & English Mustard. Lots of familiar snacks, but plenty of less common offerings as well. One of countless round-ups from the show was this one from KQED’s food blog, which notes the “anti-potato chip” as a notable theme. We ALL love potato chips, they’ll always be a wildly popular snack. 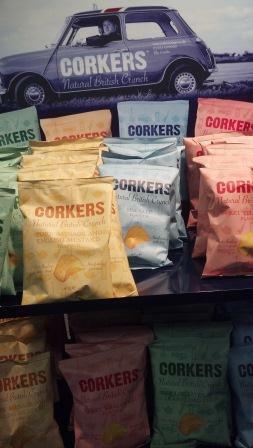 But spreading the crispy-crunchy snack love to some other foods is only a good thing for inveterate snackers. Kale’s already nearly mainstream, with plenty of other vegetables and even seaweed getting into the chip game. Among the more distinctive/unique snacks, I really liked the Out of the Box “veggie sticks” — crisp breadstick-like snacks made with chickpeas, green peas and bold but not over-the-top seasonings. Crispy whole chickpeas have been popular of late on the home-cooking front (I included a recipe with lemon and sumac in my book), but the new Crunchy Chickpeas from Saffron Road were the first I’d seen in commercial packaging. They’re not shy with flavor either! The “Falafel” version is embellished with onion, garlic, lemon, paprika and a moderate kick of heat. And the other two–Bombay Spice and Wasabi–get hotter still. On the salt front, there were also lots of selections, given the general swell of interest in specialty salts. One of the highlights for me was connecting with the folks from Sitka-based Alaska Pure Sea Salt–I’d seen their product around town but hadn’t connected with them directly yet. And this caught me in a double-take: frost salt. 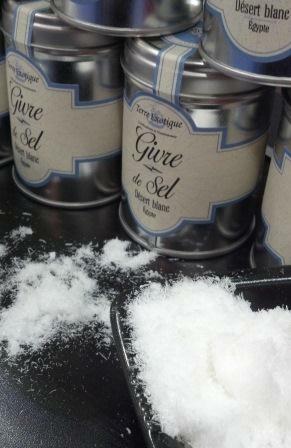 Available from a French specialty foods company, the “frost salt” is apparently harvested in the deserts of Egypt. Definitely something new to me, and I haven’t easily found other background on the salt; I’ll be digging around to learn a bit more about it. It’s striking in its feathery appearance but I think the flavor’s relatively neutral. OK, so my highlights aren’t ALL in the snacky realm. But I would be remiss if I didn’t mention that little spoonful of “Roman Swirl” gelato I had from the familiar-orange-tinged booth with Mario Batali products. Vanilla gelato accented with blood orange sorbetto, the result a grown-up Creamsicle. The sample of salted caramel gelato was a favorite bite from my trip last year. The line of gelatos and sorbettos–which includes tiramisu, chocolate, lemon among others–has yet to make an appearance in the Seattle area, so that sample last week will have to suffice for the time being. Little surprise the pints will likely have an above-average price tag. But given the intensity of their flavors, it’s a worthy investment for a special treat or to cap off a dinner party with friends. I loved hearing about Ethical Bean up the road in Vancouver, B.C., not only quality fair trade/organic coffee but a company ahead of the technology curve as well. I was told they were the first company in North America to put a QR code on their product. A quick scan with your smartphone and you’ve got information on the beans in your bag, when/where they were harvested, cupping notes from the roaster and myriad other information specific to what’s in the bag. And I couldn’t keep myself from visiting briefly with friends from home–including Renee Erickson with her Boat Street Pickles, Pamela Montgomery, founder of Chukar Cherries and Fran Bigelow, the chocolate maven behind Fran’s Chocolates. I also saw Ciro Pasciuto, founder of La Panzanella crackers who has since turned his attention to wonderful little wine-friendly snacks called Vin ‘Tucci (I particularly love the anise flavored ones). The Fancy Food Show (which holds both West and East Coast versions each year) is always a great vehicle for checking out what’s on food producer’s plates, and what we might be seeing in stores/restaurants/other outlets over the coming months and years. There’s always something interesting and delicious around the corner.